From stopping wage theft to organizing carwasheros, victories have come from meeting workers where they live. 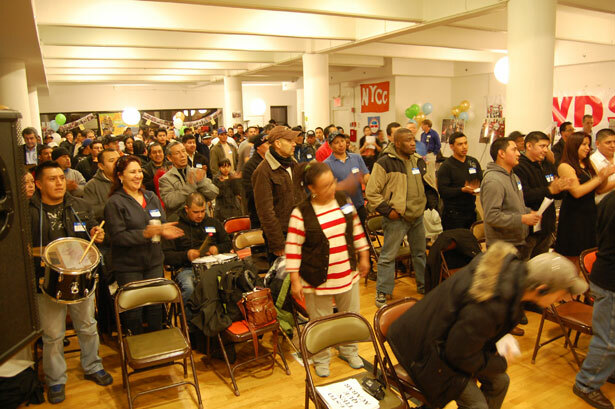 At a late-night meeting in early spring, using a form of popular theater common in social movements throughout the Latin American countries they emigrated from, dozens of immigrant carwash workers put on a play for an audience of 200 to dramatize the bad treatment and dangerous conditions in New York City’s carwashes. In the play’s final act, the carwasheros unfurl six home-made, body-length banners to communicate their demands: (1) respect; (2) better pay, paid vacation and sick days; (3) healthcare; (4) protections from abuse (something like a legal “just cause” denied to most US workers); (5) 100 percent of their tips, on top of the minimum wage, and (6) a union contract. It’s the last demand—”¡Un sindicato!“—that brings the folks in the middle of the hall to their feet, loudly stomping and chanting, “¡Si, se puede!” The audience is indistinguishable from the actors, made up mostly of other carwasheros who have turned out for the first-ever citywide Car Wash Workers General Assembly. But lining the outside walls of the room is an impressive lineup of New York City power brokers, including City Council speaker and mayoral hopeful Christine Quinn; about as many City Council members as it would take to have a quorum; the Manhattan borough president; and all sorts of lesser-known candidates running for local office in one of the largest cities in the world. The campaign for justice in the city’s carwash industry grew out of a more than decade-long grassroots organizing effort to assist the working poor to fight their way out of poverty. For the carwash campaign, the organization Make the Road New York is collaborating with the Retail, Wholesale and Department Store Union (RWDSU) and New York Communities for Change, the group that came to life after ACORN’s destruction. But the groundwork for the carwashero campaign was laid in a 2004 pilot effort initiated by Make the Road called Despierta Bushwick (Wake Up, Bushwick). By 2004, Make the Road decided to add something new to its worker justice repertoire: unions. It was a bold move, and one with a high risk of failure. Union election victories are hard to come by in any sector, especially given the incentive for employers to systematically violate the few remaining worker protections under US law. But in view of the sheer number of people experiencing wage theft, Make the Road wanted to scale up. If the workers could form unions, it would give them access to ongoing assistance and potentially raise their wages and living standards above the poverty line. Make the Road sought a union partner. Enter the RWDSU. The first tactical move for Make the Road was to map a geographic boundary of two blocks in either direction of Brooklyn’s Knickerbocker Avenue, an area where the organization had strong roots. Over the course of six months, its members knocked on more than 6,000 doors, talking with residents about the conditions that workers along Knickerbocker were facing. Many of these residents had firsthand experience in the stores, either as workers themselves or as family or friends. At the end of each conversation, the canvassers asked the residents to sign a pledge card stating that they would boycott any store that didn’t respect its workers. The canvassers also gathered information from each resident about which stores they patronized on Knickerbocker Avenue as one way to gauge the potential impact of consumer pressure. While Make the Road talked with people off Knickerbocker, the RWDSU organizers were talking with the workers on the avenue. The collaborative team began to work with the New York State Attorney General’s Office to file unpaid-wage claims. The tactic was to ratchet up the amount of back-pay claims an employer might face should they resist the no-cost alternative of agreeing not to fight the unionization effort in return for the claims being dropped. At the time, the attorney general was Eliot Spitzer, who proved sympathetic to the effort. In August 2005, with back-to-school shopping about to begin, Make the Road sent a letter to two of the chains on Knickerbocker Avenue that typified the strip: Footco and Shoe Mania. The letter notified the store owners that unless they were prepared to sign an agreement to cease their unjust practices and permit their employees to make a decision on unionizing free from intimidation or harassment, they would call for a boycott at a press conference. Shoe Mania shut down, almost certainly a response to the union threat. But Footco responded immediately and, by the campaign’s end, the workers had formed a union with the RWDSU and negotiated a collective-bargaining agreement covering about 100 workers across ten stores that included health insurance, paid sick days and vacation time for all workers, and a $3-an-hour raise. The Footco contract would be renegotiated successfully until the company succumbed, along with thousands of other small retail stores, to the economic crisis. Beyond Footco, several other results were achieved with Despierta Bushwick. Make the Road built deep relationships with key staff at city and state agencies that would enable its members to engage in what they call strategic “sweeps,” in which Make the Road and one of its union partners—typically the RWDSU—gather information from workers in an industry and a targeted area and provide it to enforcement agencies, which swoop in and cite multiple employers at once. In May of 2008 and again in June of 2009, Make the Road played a crucial role in getting the attorney general’s office and the state Labor Department to go after grocery stores for systematically stealing the wages of store baggers. The result was substantial payments, such as at C-Town in Queens, which had to pay baggers more than $300,000 in back wages; Pioneer Grocery in Brooklyn, which had to pay more than $160,000; and Key Foods in Brooklyn, which owed more than $44,000 to baggers. Before the sweeps, the employers typically made the workers sign agreements claiming they were independent contractors, paid them no wages and only tips, and yet treated them just like employees (including assigning them other jobs, like cleaning, and firing them if they wouldn’t comply). Thanks to its large membership, Make the Road helps the generally underfunded state agencies launch what feels like a sting operation against unscrupulous employers, and the impact ripples out well beyond the stores that get fined. In 2010, Make the Road led the successful effort to pass New York’s Wage Theft Prevention Act, more than doubling the fines, quadrupling penalties if employers threatened their workers with retaliation, and adding important new organizing tools (such as mandating that all paychecks include information on what the worker is being paid, based on how many hours, in the person’s native language). This converted the law from one of the nation’s weakest to the strongest. It was signed into law in December 2010 and took effect on April 9, 2011. The law “makes the hammer of reach and enforcement much bigger,” says Axt. By 2012, the late Jon Kest, former head of ACORN New York who was then the executive director of New York Communities for Change, was looking for a worker-organizing campaign where the NYCC could make a difference. He began talking with Axt at Make the Road because of the group’s long history of deep collaboration with unions, especially the RWDSU. The carwash campaign that came out of these conversations represents a bigger, smarter evolution of what Make the Road and the RWDSU began on Knickerbocker Avenue almost ten years earlier. In less than one year, workers at six different carwashes have voted yes to forming a union in National Labor Relations Board elections. Underlying all of Make the Road’s issue work is a commitment to building a high-participation organization. What it calls its “high touch” model, with dozens of weekly meetings, creates points of entry and opportunities for leadership development for Make the Road’s thousands of members. At committee meetings, where the dinner is often cooked by members at the office and served by teams carrying army-size pots of beans and rice, members discuss recent actions and plan for new ones. In addition, the group makes many of its services—from legal help with bad landlords or bad bosses, to ESL classes, citizenship classes and more—conditional on members’ participating in at least two activities per month, creating a sustained participation level where activism constitutes a kind of dues. High participation is crucial to just about every strategy available to the left. From disruptive strategies like protests, civil disobedience, blockades, occupations, boycotts and strikes, to electoral campaigns, winning and enforcing strong union contracts, and even legal strategies, the most important factor in determining success has long been people power. Make the Road’s diverse issue mix, including workplace and community issues, covers just about every serious problem bearing down on the lives of workers and the poor. This breadth enhances the group’s ability to recruit new members. Plus its high-touch model also aids in the development of large numbers of rank-and-file leaders, which enables large turnouts at its various actions. With unions representing just 6.6 percent (and shrinking) of the private sector workforce, and given the expansion of the informal economy, the fight to expand and improve unions is just as crucial as improving the regulations that protect all workers. And the power to enforce laws and union contracts flows from exactly the same source: robust, democratic, high-participation organizations. If more sectors of the progressive movement in the United States decided to adopt the high-touch and multi-issue elements that have enabled Make the Road New York to thrive, we’d spend less time licking our wounds and more time celebrating our successes. From the Bronx to Brooklyn, workers at car washes and fast food joints are finding ways to fight for their rights, reports Lizzy Ratner (April 18).